It has been a while since I updated this blog, but I have taken Tim and Skye motorhoming for a few weeks before Annie is released from hospital. We are currently on the banks of the Darling, near Wentworth NSW for a week but will be home by month's end. 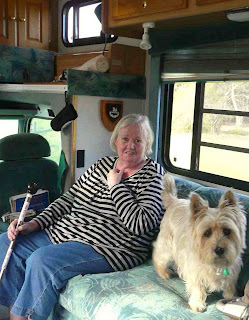 By the end of May Annie had progressed to walking with a cane and actually climbed up the steps into her motorhome with two hospital OTs in attendance to determine what she will need once she moves "home". It seems the only requirement will be a hand rail in the shower. She was able to get in and out of the shower, in and out of her bed, and move around easily. AND- this is the first time that Skye has gone into the motorhome since November. Since the first couple of times she went in after it was delivered to my place, she has totally refused to even enter the shed where it was parked. But once Annie climbed in, Skye went in too. Annie went back to St Vincent's Hospital in Melbourne for a day check-up a couple of weeks ago, but they ended up keeping her (hostage) for 10 days while they did some tests, stopped her intravenous antibiotics, and did more tests. She finally got back to the Bairnsdale Rehab unit last Friday and is now feeling extraordinarily well and lively she says. Those very strong antibiotics were keeping her feeling constantly weary. And now she can sleep through the night with no one waking her up at 2am to pump stuff into her! Yesterday she told me the nurses are having her do all her own injections and medications so that she is prepared for the outside world. She is going to the gym twice a day as well. Its looking like she will be back in the motorhome (which is parked outside my house and connected to power) as soon as I get home with the dogs. There is one final clinic she needs to attend in Melbourne about July 7th and we think she will have some sort of hospital transport to there for the day.